Ultimate Hi Point Trigger Upgrade for Hi Point Carbine Accessories! Ultimate Hi Point Trigger Upgrade for Hi Point Carbine Accessories! Ultimate Hi-Point Carbine Trigger Upgrade! Nearly 35% Trigger Pull Reduction! Best Aftermarket Hi Point Carbine Accessories! The major compliant with the Hi Point Carbine 9mm is that is has a very heavy 8lb factroy trigger pull. This leaves a lot of us looking for affordable hi point 9mm carbine accessories to make further improvements on factory parts. Hi-Point Carbine Accessories should include the Best Custom Hi Point Trigger Upgrade for the money! Fast Installation Hi Point Carbine Trigger Upgrade for a 30% Trigger Pull Reduction. This is one of the must have Hi Point 9mm Upgrades on your Hi Point Carbine Parts List! Hi-Point Carbine Trigger Spring Kit will improve accuracy and tighten your shot groups! Aftermarket Hi Point Carbine Accessories should give you the most bang for your buck like the Ultimate Hi-Point Carbine Trigger Upgrade! One of the Best Aftermarket Hi Point Carbine Accessories you can make to improve your Hi Point Carbine Performance! These Hi Point 45 ACP Accessories are also compatitable as Hi Point 995 Accessories since Hi-Point used a lot of the same parts in their trigger assebmlies between Hi Point Carbines. This is the best was to upgrade the trigger on your Hi Point Carbine and is one of your Must have Hi Point Carbine Mods! Custom Hi-Point Firearms Accessories made right here in America! If your looking for hi point 45 carbine accessories then you need to do a Hi Point Carbine Trigger Upgrade and feel the difference for yourself. If your getting the Hi-Point Carbine Trigger Spring Kit, then you might find the following Hi-Point Carbine Resources useful in further enhancing your firearm for other Hi Point Carbine Accessories. 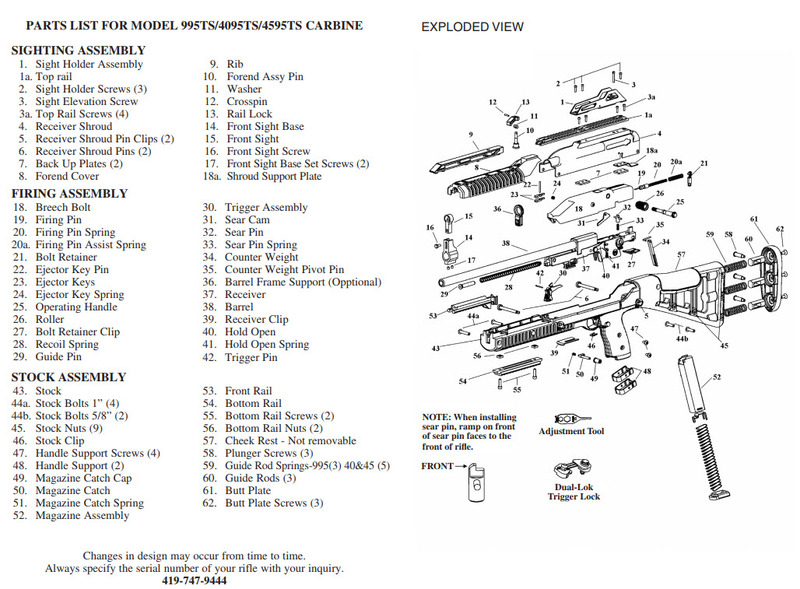 Download the Hi-Point Carbine Owners Manual. The Hi-Point Carbine Trigger Upgrade Trigger Spring Kit is protected by the M*CARBO No Hassle 100% Lifetime Guarantee. This means that at any time you can send it back and we will exchange it, issue a refund or assist you in any way possible. We even pay return shipping and automate the return process here! The Hi-Point Carbine Trigger Upgrade Trigger Spring Kit has been tested repeatedly with numerous brands of ammunition to ensure reliable operation and safety. American made Hi-Point Carbine Trigger Upgrade Trigger Spring Kit designed and manufactured by Combat Veterans. We will donate a portion of your purchase to the Military Foundations we humbly support. You must be 18 yrs of age to purchase. We advise that all parts purchased from our inventory be installed and inspected by a qualified gunsmith. Modifying your weapon may be prohibited in your state. Do not modify your sear or hammer engagement surfaces, with or without the Hi-Point Carbine Trigger Upgrade Trigger Spring Kit. Before installing please be sure to check all local state and federal laws. By installing this part you agree to take full responsibility for any and all legal, health and warranty consequences that may be incurred. Q: Which Hi-Point Carbine will this Trigger Upgrade work for? This trigger spring made a 100% difference in my accuracy at 50 yards. I have an excellent scope and I am a good shooter. My police training in firearms, stance, and tactics was extensive. I bought this little Hi Point 995 TS to replace my .357 Henry lever action rifle because my arm strength just isn't what it used to be and the Henry was much too heavy with the bull barrel. I noticed when pulling the trigger it felt like there was sand in the trigger mechanism even when the rifle was new. A 6" group was the best I could do, consistently at 50 yards. After purchasing and installing the Hi Point trigger upgrade and installing it I can routinely shoot 3" groups at 50 yards no problem at all. I was amazed at the difference. The trigger now feels smooth and crisp like it should have from the factory but then, what do you expect for a little North of $225.00? Thanks M*CARBO for a good product. I actually enjoy shooting my Hi Point not. Ordered for my Hi-Point 995ts. Received in 3 days. Installed and had the gun back together in 10mins. Haven't been to the range yet but it feels like a night and day difference. If you don't have it yet GET IT! My spring arrived earlier than I really expected, it was like Amazon quick. The spring was easy to install and works great. My 4095 carbine now has a clean crisp trigger feel now. Finally, I really appreciate the personal touch from MCARBO in the fact that someone actually reached out to me and inquired about by satisfaction with delivery and product. It's refreshing to experience good customer service. I will absolutely be purchasing again from MCARBO. Thanks for your service to our country as well! The installation was easy and your video on the installation of the trigger spring was easy to follow. Great customer service and fast shipment to me. Thanks again from this Vietnam Vet.